We now have two weekends in a row that we can say, “well done.” But we don’t rest on our laurels as traders- we know the work is never “done.” It only takes one blink of the eye and everything can become “un-done,” so we plan for the unexpected and look under every nook and cranny while we plan for the next trading days ahead of us. It’s this type of planning that puts you one step ahead of the pack and perhaps increases your odds for successful trades. One advantage to blogging is you are forced to live with the charts, and I don’t just mean the SPX or the Qs- I mean you live with as many aspects technically that you can keep your eyes on. I noticed one prominent technical analyst, whom I deeply respect, posted some of the international charts up on Friday, and I was thinking to myself, “what took you so long?” Those are the moving parts that create the “unexpected,” and you don’t need to read or listen to the news to see what will most likely unfold if you know where to look first. We’re detectives- that’s really all this is. And the bulk of the detective work should happen when the market isn’t open. Live with your charts. All the smaller moves during the day can be anticipated, and the machine runs far better with the speed of the tape. This should unfold into a VERY busy month based on our various cycle studies and so forth, so make sure to get your rest, and particularly on nights when you know the next day’s tape could be wild. Most of all: know your plan Stan, and make sure it includes an exit strategy right off the bat, otherwise you might as well walk over to your nearest wall plug and stick a fork in it, because the unexpected we’ll probably witness might shock you anyway. I have a collection of DeMark charts from our own extraordinary posters this weekend- it’s a virtual dueling DeMarkians fest! I’ll post a few of my own simple Simons down in the posting section during the weekend. We are traders who don’t rely on just one thing- we throw everything we can at this tape, and then some- and it’s working! I do urge all of us not to become too haughty or elevated with our egos as successes comes our way- a bloated ego can be the ultimate demise of an otherwise fine trader. Let’s also remember there is a difference between conviction and ego guided contrarianism. The tape is the ultimate decision maker, not us. There are no hard and fast rules at this casino we call the market. We’ll remember that in our days ahead, and be better traders AND human beings for it. One last thing: use caution toward over-trading if you’re struggling while we navigate what lies ahead. Over-trading has little to do with the number of trades you make, and everything to do with the size you’re trading with. Size does matter, especially in a volatile situation, and can play games with your personal fear factor tolerance. On to the charts, and many thanks to everyone in this group, and especially those who take time out of their own busy trading to post a chart or help a trading buddy during the day. You guys are my trading heroes, and yes.. I proudly put you up on pedestals, just don’t fall off and break your noggins, deal? If you have any questions about these DM charts, the guys are here to help you as time allows. Trivia question for the weekend: How many trading days from the pivot highs before the crashes in 1929 and 1987? How many days from the pivot high in April until 6/3/10? 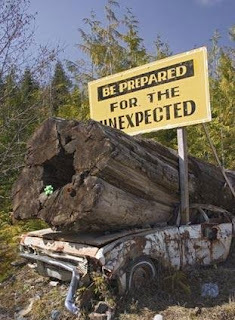 I'm reading: Expect the Unexpected $$Tweet this!